What's New to this Site? 03/24/2014 - New page 1988 Grand Canyon mule ride down to the Phantom Ranch added. 08/01/2010 - As memories fade, time to preserve some history of times past. My brother and his love of flying. 02/07/2010 - Clean up of broken links, etc. 11/11/2004 - "Understanding Batteries and Charging Systems. article added. 07/23/2004 - Major site update in progress including menu page to the Outdoor Recreational Network 4x4Wire publications I've authored or maintain. 01/03/2003 - GPS section updated on the use of the ChargeGuard Model CGD12D to power the GPS system and other accessories. 11/25/2002 - A few photos, videos and links to more information on the Mid Atlantic Early Broncos Fawl Crawl 2002 event. 11/02/2002 - New Section "Crosslinked Rear Axle Air Shocks with In Cab Control System" added. 10/04/2002 - New Section "Navy Nostalgia" added. 08/14/2002 - Web site changes to accomodate move to new BellSouth Personal Web Page Server. 07/04/2002 - GPS section updated to show navigation techniques and tools I used prior to GPS systems being available. 06/21/2002 - Welding section updated with information and links to Australia DOT National Code of Practice for Chassis Frame modifications to Heavy Vehicles. 06/17/2002 - Additional detail added to rock slider/frame cradle section. 05/24/2002 - New links added to Welding section to add reading material to learn more about welding. 05/14/2002 - Site added to and "What's New" section added. A recent visit to Charleston, SC prompted me to add a new section "Navy Nostalgia". While visiting an amateur radio buddy, and the Charleston Amateur Radio Society repeater site, in this case on board the USS Yorktown (CV-10), it turned out to be some interesting ham radio stuff and a lot of Navy nostalgia for me. A lot of it is focused on naval aviation. My time in the Navy at sea was on board the USS John Paul Jones (DDG-32) which deployed in company with the carriers USS Ranger and USS Coral Sea. While I did only 3 years active duty, my older brother was career Navy and an F-8 Crusader pilot. The Crusader was the first level flight supersonic carrier aircraft, and of course, the subject of many a late night interesting conversations. I decided it was time to put some of this out on the web. 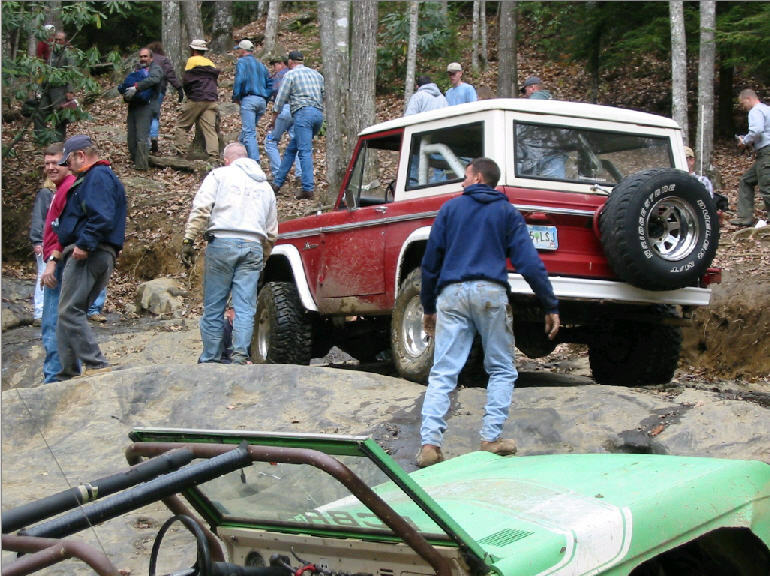 Really enjoyed the Mid Atlantic Early Bronco 2002 Fawl Crawl at Tellico held on November 8th and 9th, 2002. I rode right seat in Brian's Bronco pictured below. Like playing in mud? Click on the image below to check out the mud pit at Crawfords campground. 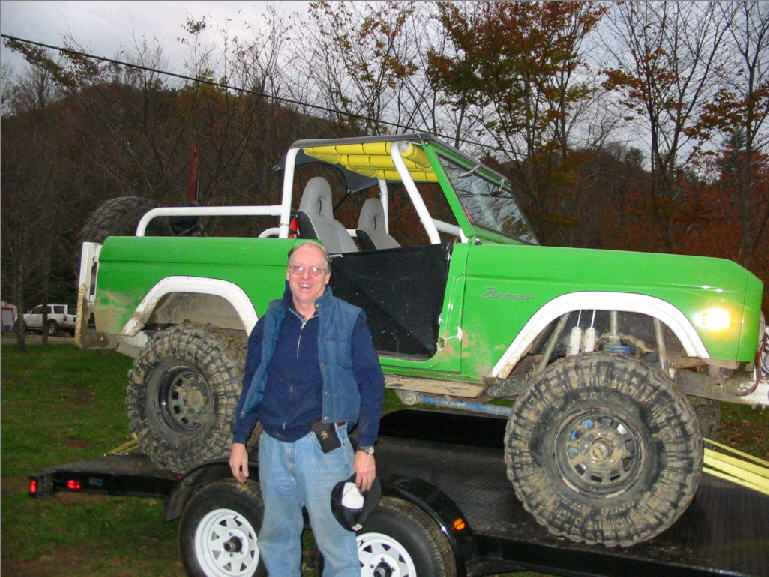 My role in building this Bronco was welding up the suspension kit (shock hoops, rear shock mounts, etc), radius arm mounts and additional tubing to make a full roll cage. In another session, rock sliders were welded to the frame, and reinforcement of the radius arm mounts and a few other areas were done, and it goes on.. suspension link bars to minimize axle wrap and now we have a fully tied in roll cage to the vehicle frame.. Slickrock at Tellico certainly gave a warning call just how important this can be... These things are never really "done". The information I found (and have posted at the bottom of the welding section) on the proper methods for welding on vehicle frames was very useful. As shown below by the polished and extremely slick rock, "Slickrock" aka "roll over hill" is certainly aptly named. Click on the image below to see a video demonstrating just how slippery it can be. For more photos and information on the experience take a look.